Views of Trujillo from Santa María la Mayor’s church tower. After more than a year together I thought it was about time to take my Scottish boyfriend to Extremadura and show him around the region I come from. He’s been in Spain many times, but only to Madrid, Barcelona and main tourist destinations on the coast. 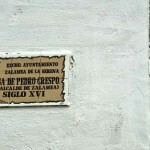 This trip to Extremadura would show him another Spain and would be a new experience. It would also be the perfect occasion for me to know what a Brit thinks of my home region. 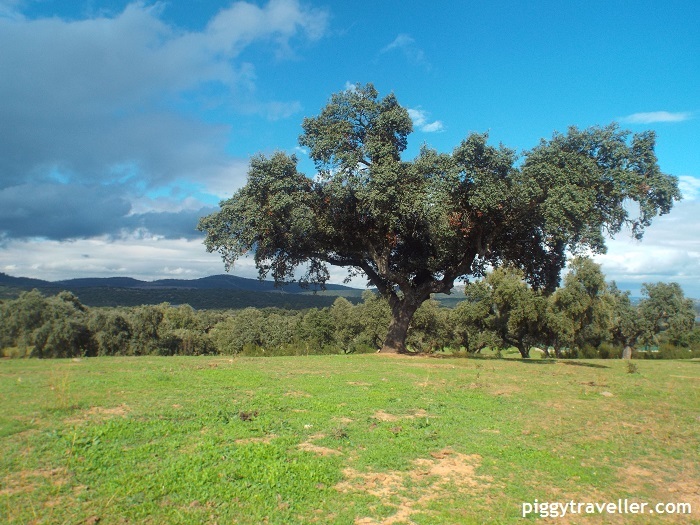 I wanted to share his impressions with you on this blog and I hope you find this interview interesting and helpful if you have been toying with the idea of visiting Extremadura. 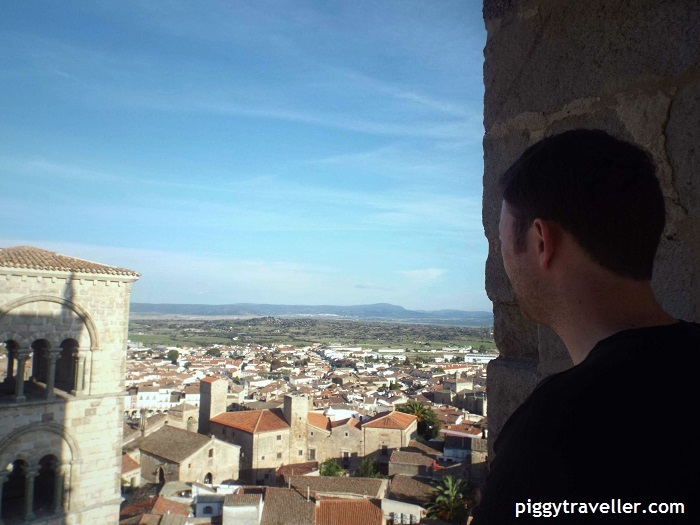 What did you know about Extremadura? What were your expectations before the trip? Not a lot. I knew it was a quite big, but not very densely populated area near Portugal and, of course, I knew about the black pigs that eat acorns here. I didn’t really know what to expect, to be honest; perhaps just a vast countryside with single-track roads. I didn’t expect monuments to be in such a good condition either. 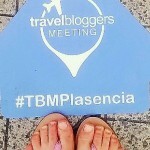 You have spent ten days in Extremadura visiting Trujillo, Don Benito, Cáceres, Alburquerque, Mérida and Medellín. Any favourite places? A view of Cáceres’ medieval streets. They all had awesome features. 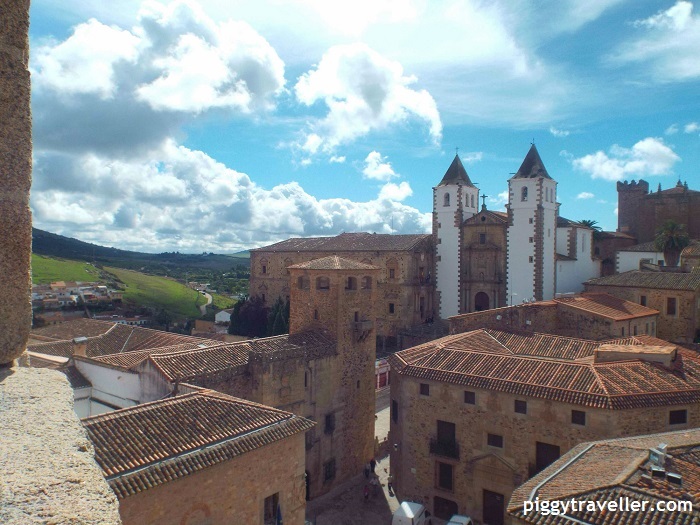 The highlights would be the views from Santa María church tower in Trujillo, Cáceres’ medieval streets, Alburquerque’s castle and some amazing houses built into the rocks, Mérida’s Roman theatre and amphitheatre and Medellín’s Roman theatre and views from the castle. 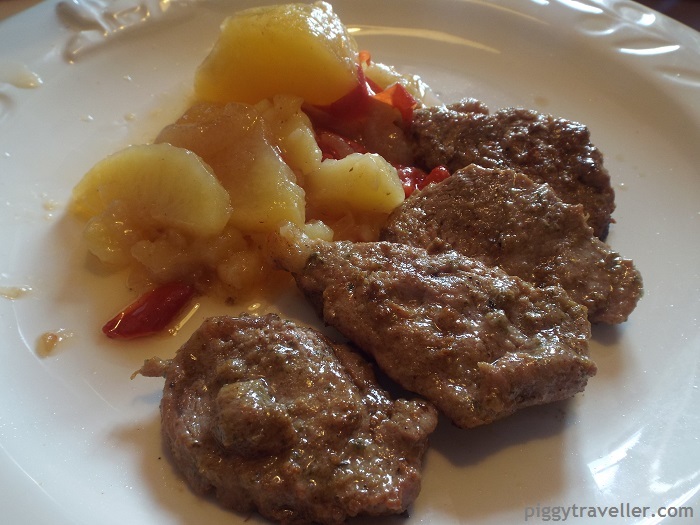 What did you think about food in Extremadura? Did you try anything different to what you are used to eating? What would you recommend other travellers to try? I thought food was really good. I tried lots of good Iberian pork (which was awesome), ham, cheeses, flan (caramel custard, similar to crème caramel), migas (fried breadcrumbs) and I even had rosquillas (Spanish doughnuts covered with sugar) for breakfast. I would definitely recommend trying Iberian ham from local acorn-fed black pigs and all things Iberian, such as lomo (pork loin) and chorizo, as well as sheep cheeses like Torta de la Serena (creamy cheese made from Merino sheep milk) and goat’s cheese with paprika. Solomillo ibérico (the best cut of pork, located right under the loin) is a great option for a main. Sweets like perrunillas (a traditional sweet made with lard that has a very rich taste) are awesome and, if you happen to be in Alburquerque, buy some empanadas (sponge cake-stuffed flour pastry covered with sugar) and have them for breakfast or coffee time. What was the most shocking or surprising thing you have seen? A small little house carved into a stone in Alburquerque. There was this huge stone inside two of the bedrooms that left little room for you to move. I cannot believe 8 people fitted into that house! Sadly, I also noticed many shops have closed down and there is a number of houses for sale in all places I visited. What differences between Extremadura and Scotland/the UK have you noticed? People are generally more relaxed in Extremadura. Lunches are bigger too. In Extremadura, shops and bars stay open later and tickets to monuments are way cheaper than in the UK. Despite all the monuments, Extremadura receives less visitors and does not have as many tourists as I would expect. Give three reasons why someone should visit Extremadura. Dehesa (pasture land) near Alburquerque. It hasn’t really been explored, so it’s not exploited. It does not have this big city culture, so it’s still quite traditional, which is a nice thing to see. My friend from my village in UK is a keen fisher & bought an apartment in Medellin some years back. I’m a walker, so when invited out in Sept 2013 arrived with an open mind. I’ve been seduced – back again in June ’14 & I’m showing another mate round in May this year (partially to see CD Don Benito play!).. as you say the dehesa & mountain views are awe inspiring – the unfettered access to the history & charming people make it special. Trujillo for me, but Merida, Caceres are fantastic! Love it! Hi. 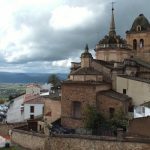 Thanks for your wonderful post> I’ve been to Caceres, Trujillo and Guadalupe some years back and I can truly say that I’ve been smitten by Extremadura. I hope it does not get exploited by tourism. Thanks for your comment. I’m glad you liked Extremadura and I hope you have the chance to go back and explore a bit more. There’s till a (very) long way to go for Extremadura to be on people’s destination lists but, as much as I want people to visit it, I hope the regional and local authorities make sure it is responsible tourism what we get, not mass tourism! I was in Caceres for a few months, and it was really nice and peaceful. It would be a great place to lay down your hat for the rest of your days, I think. I remember taking the bus from Madrid to Caceres and it stopped off at Navalmoral de Mata, I remember getting off the bus and being hit by this beautiful clarity and sunshine, it was really clear and something I have never really experienced (to that degree) before. The only minus for me was that it got light really late on in the morning, it is still pitch black at 7.30 in the summertime, it might not be a problem for other people but it knocked me out of my stride but apart from that – Extremadura gets a thumbs up from me! Thanks for leaving a comment on the blog, Billy! I love hearing stories from visitors to Extremadura. Navalmoral is a regular stop on that route, although it’s not a particularly interesting place to visit. I know what you mean about the light. It may take a while to adapt to it, but it helps you sleep a bit more :). We Spaniards complain about other countries for the exact opposite reason – for getting light too early and rooms not having blinds! May I ask the reason why you stayed in Cáceres for that long? Did you have the chance to explore other towns and cities? Any other favourite places? For sure! I was living and working in China and wanted to make the move to Spain for awhile, but I never fancied the Costas or Barcelona, I wanted something a bit more off the road and Extremadura fitted the bill, also my mum is from South America and her family originated from nearby Bejar so it all came together to make the move. So I took mum out so she could visit Bejar and the bus from Madrid took us through this amazing countryside – it was like a wild west movie, not a car on the road, just our bus chugging along the motorway, miles and miles of empty road – it was a complete contrast to the crowded beaches of somewhere like Magaluf – but there was this beauty that was apparent and then you had these wonderful, clear, crystal blue skies – we got off at Navalmoral de Mata and it was like the sky and the sun hit you as you got off the bus, like your eyes getting wiped and everything was in sharp focus – in China, where pollution is everywhere and sometimes, a film of fog covers the mid-distance – it makes for a nice change. So Caceres was wonderful – free tapas! There aren’t many places in Spain that still practice this but they do there – I was there for awhile and the plan is to move to buy a flat for when I finish traveling around the world, and Caceres fits the bill nicely, it is wonderfully peaceful, it isn’t Andalusian hot nor is it too cold and even though it has a superb old town, the new town had everything you need in regards amenities and of course, you are equidistant between Seville, Lisbon and Madrid, so it’s not like you are in the middle of nowhere. We went to Trujillo which was lovely but tiny, Plasencia was nice – home of ‘El Chinito’ saffron – again – the centre was very nice – I liked it and though it’s Castilla y Leon – Bejar – though it’s on the border of Extremadura – so I will mention it here, that was amazing to go back to my ancestral home, it was freezing when we got there though it was July and then we found out that it is a skiing resort in the winter. It warmed up later on though, it’s tiny but lovely and has a great Jewish museum. So, the choice is between Galicia and Extremadura to buy a flat, I fancy life by the sea but life with that kind of peace and tranquility that you find in Extremadura is really hard to beat. Especially as I am going to buy a place for my retirement, I think Caceres fits the bill perfectly. The weather is great, the food is great, the people are friendly, there’s no Brits – as in like none at all… I am quite neutral about this though but I can see why most Brits continue to ignore Extremadura, there isn’t a British bar scene there nor can you just get by in English, you really need Spanish to live there which you don’t need on the Costas or in The Balearics. So, for now, Caceres has won the vote but I am planning on checking out Badajoz and Merida as well, Zarautz looks nice but is probably a bit too far out of the way. Caceres has everything in regards being accessible, having everything you need in regards not being too remote, good climate, good food, extremely safe and a great cost of living, just put that damn clock back!! Keep up the good work, Irene, it’s a great blog! Zarautz = Zafra – been up all night watching Theresa May get trounced, my apologies – Zarautz is out of the way!! 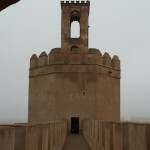 Whereas Zafra looks nice but a bit out of the way…. Thanks for taking the time to share your story, Billy. It must have been very nice for your mum to see where her ancestors came from, and for you to see it with her. I see what you mean about being between Galicia and Extremadura… However, if that helps, northern Extremadura is full of natural pools where you can swim in nature (anywhere in the north, really – La Vera, Jerte Valley, Las Hurdes, Sierra de Gata…). 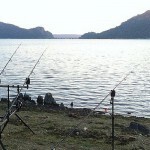 Thanks also for the good comments about the blog. I love sharing things about Extremadura and discovering new places every time I go back. I hope you find it useful or interesting!